This week SAT interviewed artist-musician-writer, autism advocate and PhD candidate Dawn-Joy Leong. Her assistance dog, Lucy, is a greyhound. 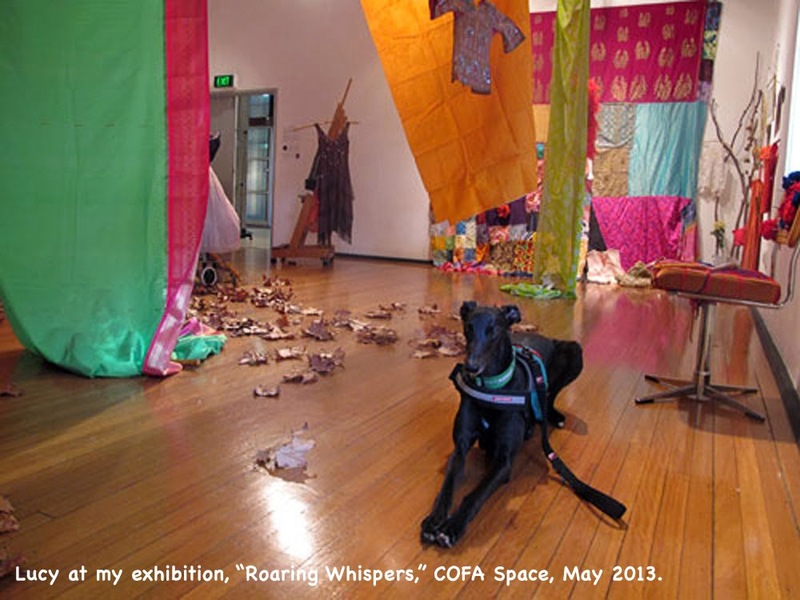 They spend much of their time in the studio at the University of New South Wales' College of Fine Arts. As a vet, I often interact with my patients and their owners only at work. But they have rich and complex lives outside of the consulting room. Dawn-Joy was only too happy to discuss her bond with Lucy at length. So make yourself a cuppa and enjoy this beautiful story. ...eternal student of life, trundling in a rusty old wheelbarrow along the rocky road towards a Ph.D, flipping the pages of imagination, creating dog ears, making splotches, humming in and out of tune, dancing around polyrhythmic-chromatic-pandiatonic mental fires, flying and falling, meandering in and out of discombobulation, gazing at pulchritude, picking up sound waves, stroking, caressing, embracing and learning new ways to see. Accompanied on this wonderful journey by my beautiful greyhound, Lucy – what more could anyone wish for? Your PhD is about neurodiversity...what is that? My research and artistic practice is about autism, creativity and designing mutually empathic platforms or spaces for people of all neurological cultures to enjoy. Neurodiversity refers to the inclusive concept that since our brains function in myriad ways, conditions such as autism, attention deficit hyperactivity, dyslexia etc should not be viewed in a negative light, but rather merely as varied neurological functioning systems. My artistic practice is a constantly evolving learning journey about Self and Other, using artistic expression as a means to reflect on differences and similarities, juxtapositions, intersections and building enriching co-existence. "I could not get her to sleep in her own bed thereafter" - Dawn-Joy on Lucy. How did Lucy come into your life? Pets, especially dogs, were always part of my family life. My father was a firm believer in adopting, rather than buying, and this too is my view. 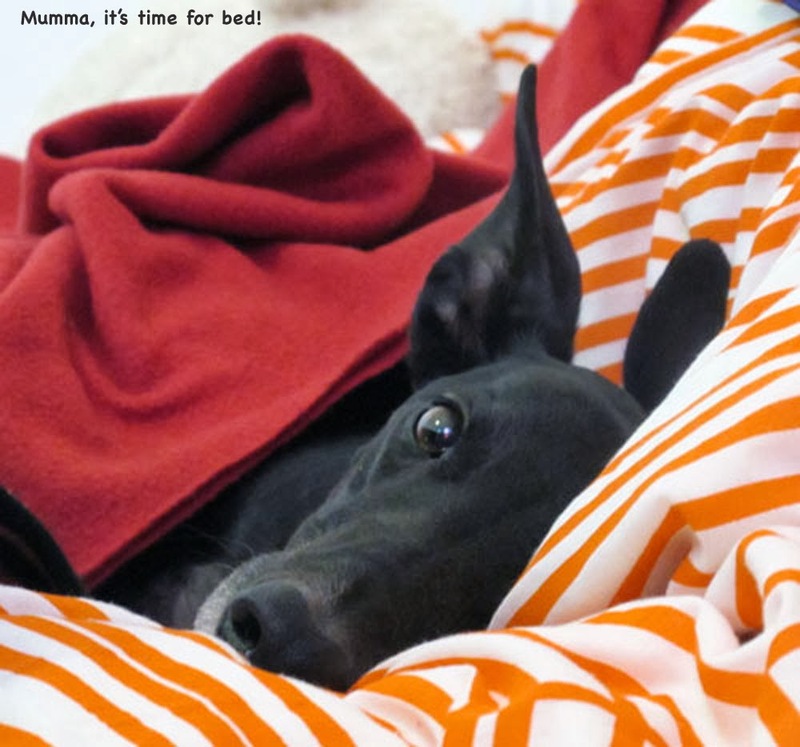 When I first arrived in Sydney two years ago, I volunteered to foster a retired racing Greyhound, and I was given Lucy. I had read about the plight of these beautiful dogs, who are bred mainly for the purpose of racing. I was appalled when I learned that out of the tens of thousands bred a year solely for the purpose of racing, only a very small fraction actually end up adopted into homes as pets. I wondered where the 'wastage' ended up, and I wanted to do my small part for these noble animals. Looking back, she decided to adopt me long before I made the decision myself. The rehoming organisation instructed not to allow her onto my bed, because there was no telling if the future family would like that or not. Hence, she slept in her own bed just next to mine. One night, we both happened to wake up at exactly the same moment. I sat up, and saw her eyes staring straight into mine. She held my gaze for a split second, though it seemed like an eternity, then she jumped into my bed and curled up next to me. I could not get her to sleep in her own bed thereafter. I signed the adoption papers a month later. Many people don't realise that greyhounds can be service dogs. How does Lucy support you? Greyhounds are probably the most misunderstood breed of dogs, next to Pit Bulls. 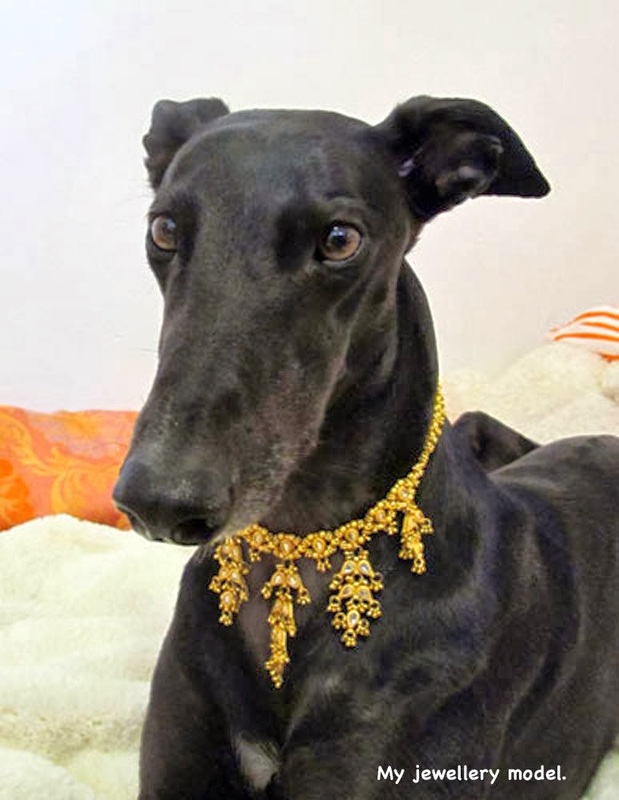 While it may be true that they can be fearful and skittish, and not all former racing Greyhounds are suitable for rehoming, this has less to do with their intrinsic natures, but rather in the way humans treat them during their growing years, being groomed only for the racetrack and nothing more. In actuality, Greyhounds are very suitable as service dogs and therapy dogs for certain kinds of conditions, and I hope more and more will be retrained for this purpose. As in any kind of close affiliation, a service dog and his/her human partner need to be the right match for each other. In my case, Lucy is perfect in every way. I am autistic, and have autism-related hypersensitivity. This means that my senses (e.g. smell, hearing, touch, taste and vision) are very much heightened, and what may seem innocuous stimuli to the general populace can be very challenging and even excruciating for me. 1. Lucy is very quiet and gentle. I love all dogs, and I know it is natural for dogs to bark, but sudden loud noises shock and upset me, especially when I am trying to concentrate on a task. Like most Greyhounds, Lucy does not bark, unless we are engaging in our special playtime conversation. As soon as I end our little tête-à-tête, she will stop too. She is not a 'watch dog' of course, but she does alert me to changes in my surroundings through her body language, rather than barking. Lucy is also my 'wake up call.' I don't need to be shocked into consciousness by an alarm clock with Lucy by my side. Lucy wakes me up at 5.30am every morning, placing her head very softly on me, and cuddling close if I stir and reach out for her. As soon as I open my eyes, I see her watching me attentively, alert to my every nuance. Lucy is so silent that nobody else living in my apartment block will even know there is a dog present, if they do not bump into us at the lobby! Lucy is a very quiet dog. 2. Lucy is very clean. I am fastidious about cleanliness and odours - dirt and foul smells upset my equilibrium and often trigger reactions such as nausea and anxiety. Lucy prefers not to walk on wet surfaces, soggy or tall grass, she will never roll in mud or dig holes, she doesn't poke her nose into the rubbish nor sniff at other dog's poop, and will quickly step away from her own as soon as she is finished. She likes being clean and enjoys it when I wipe her paws and all over, each time we return from our walks. Lucy also does not shed as much as other dogs, and she does not have the strong 'doggy odour' common in most other breeds. In fact, I often tell my friends that she smells like warm vanilla! A friend of mine who has looked after Lucy twice, while I was away on working trips, calls her the Princess, because of her dainty ways. 3. She is very serene and composed. She doesn't shock me by making sudden or jerky movements, she never jumps at me, or skips around me - even when she is very excitedly waiting for her treats, her gestures are always fluid, smooth and gentle. 4. Lucy reminds me to do what is important. Routine and repetition are also crucial parts of autistic function. Lucy mastered our schedule very quickly. She now reminds me when it is time for breakfast, her early morning walk, her longer morning long walk, our afternoon break, dinnertime and our final evening walk. However, on the flip side of routine, the autistic brain also has the propensity to concentrate so intently on an interesting task that we often forget to be kind to our bodies, we do not take the necessary breaks and we forget the time. When that happens, and I am lost inside the vortex of an absorbing task, Lucy will bring me back to our regular routine in polite and sweet little ways: a meaningful look, a little nudge, a sniff at my elbow, and even sliding gently between me and my work table and popping her head through to kiss my face! Lucy (at the studio) gently reminds Dawn-Joy to take a break. 5. She is sociable and friendly. Lucy has no preconceived notions of social impositions, she is just confident about who she likes and who she dislikes. Through her, I've made an assortment of friends, some of whom I never would have known, if not for her. Unlike many other autistic people, I do not suffer from self-confidence issues or a fear of socialising, but I just do not feel the desire at all to socialise merely for the sake of interaction alone. However, as soon as I began to walk Lucy, people in my neighbourhood would approach me to chat. Greyhounds are an uncommon sight, even in a neighbourhood like Paddington, where I used to live, and almost everyone has a dog or two. Lucy has opened up so many new socio-perceptual and existential paradigms for me, and now, even superficial small talk with strangers has become a way in which I can engage in some meaningful autism advocacy, as well as promote Greyhounds as wonderful assistance dogs! 6. Lucy helps me with gentle exercise. Greyhounds do not need as much exercise as some more active dog breeds. They prefer to sleep and laze at home all day. Lucy is a typical Greyhound in this respect. She loves going out for short walks, but does not like too vigorous or arduously long periods of exercise. I used to suffer from severe arthritis, but our regular gentle walks have eased my condition so much that I have not had a major flare up since Lucy came into my life! Of course, when I do get the chance to take Lucy to a fenced park, she thoroughly enjoys running around at super Greyhound speed! However, even then, she tires quickly, after only a few minutes, and returns to my side panting, and ready to lie down again. People who do not know Greyhounds well are often quite surprised by this, as the misperception is that they require a lot of strenuous exercise daily. Greyhounds don't run around like greyhounds all day! Why is it important to be able to bring her to uni with you? Lucy basically functions as my support against sensory anxiety, which many autistic people suffer from, due mostly to hypersensitivity and intense detail focused cognition, juxtaposed against the challenges of living in a world that is too often overly stimulating and demanding on our senses. She is not only a comfort to me, but also an important practical distraction. First thing in the morning, I have someone who needs me to get out of bed promptly, bring her outside for her morning micturitions, and take care of early victuals. This literally means that I cannot afford to lie in bed in a state of high anxiety, I just have to get up and go! That she is cheerful and greets the day with zest makes the assignment all the more pleasant. Once I am up and going, my brain 'switches gears,' away from anxiety to focus on the tasks at hand. When I have to spend long hours working at my studio space in the university, Lucy is both my anchor of calm and a distraction from anxiety triggers. When I feel sensorially disturbed or overwhelmed, having her by my side to stroke, hug or even divert my attention towards, helps me to refocus, like taking a deep breath. Her scent also has a surprising calming effect on me, much more effective and unique than essential oils! Sociable as she is, Lucy nevertheless does not like too much noise or large confusing crowds, and I have found that she will lead me away from potentially overwhelming spaces, even before I notice them. Hence, I like to take her everywhere I go, not just to university, but being a Ph.D scholar on a tight budget and time frame, the university is of course where I spend most of my time when not at home working. How would you describe your bond? I like the title of Temple Grandin's book, "Animals Make Us Human," because it is so very true! Dogs have the advantage over other pets in that they show remarkable desire and instincts for attachment with humans. I have always bonded better with dogs than with humans. With Lucy, however, it is a very special connection - ours is a symbiotic relationship. She knew from the very start how to support me in the ways which I prefer and need: she is always positively confident, exuberantly inquisitive, gently affectionate but not needy or overt in her gestures. I never had to teach her that. 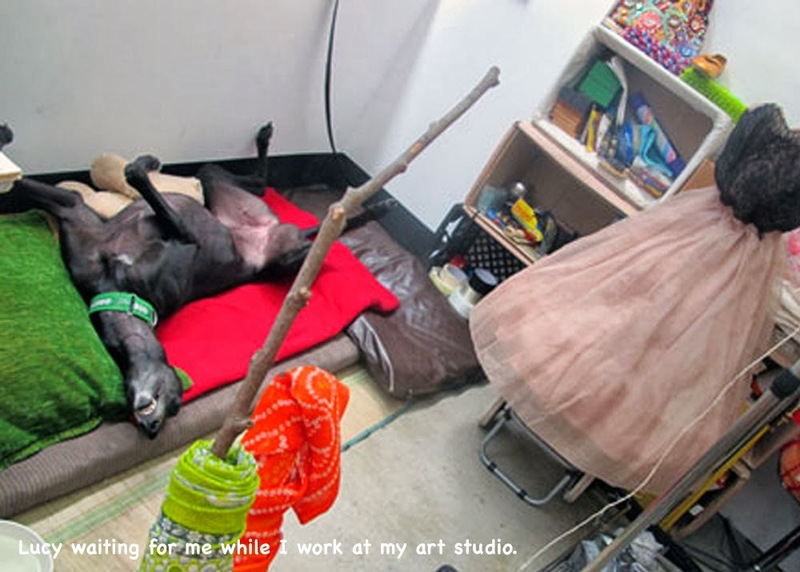 I work at home and at my studio in the College of Fine Arts. When I am working, Lucy waits patiently for me. She snoozes in her bed, and each time her eyes open, they are focused on me. On my part, I strive to be as attentive to her as she is to me, and I know she appreciates that a great deal. When we are outside walking, my focus is on her, rather than socialising. Even when people stop us to chat, I don't lose my focus on Lucy. I am constantly observing her body language, I want to know whether she is happy, comfortable, interested in something, or uneasy, bored or anxious. Having hyper senses does help me tune in to her better, and I enjoy learning about her as much as I can. 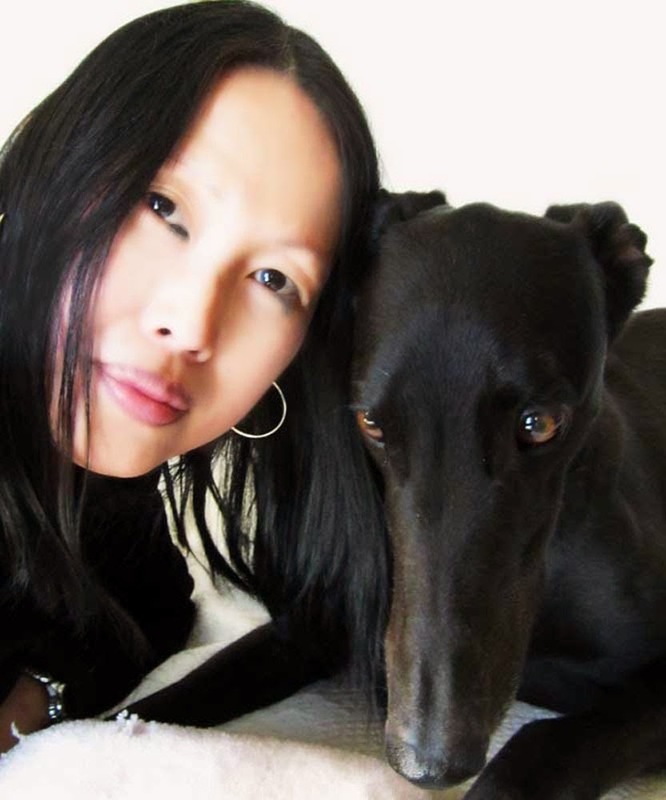 She has led me to do extensive research about Greyhounds, and revived my interest in behavioral studies. It is inevitable, then that Lucy has become an inspiration for intellectual contemplation and artistic creativity, and I have stumbled upon many interesting ideas just from observing Lucy and juxtaposing her sensorial abilities against my own. I have also learned a great deal about life, living, patience, endurance and simple trust and love, from her. Lucy enjoys being out, discovering new places, and making new friends. 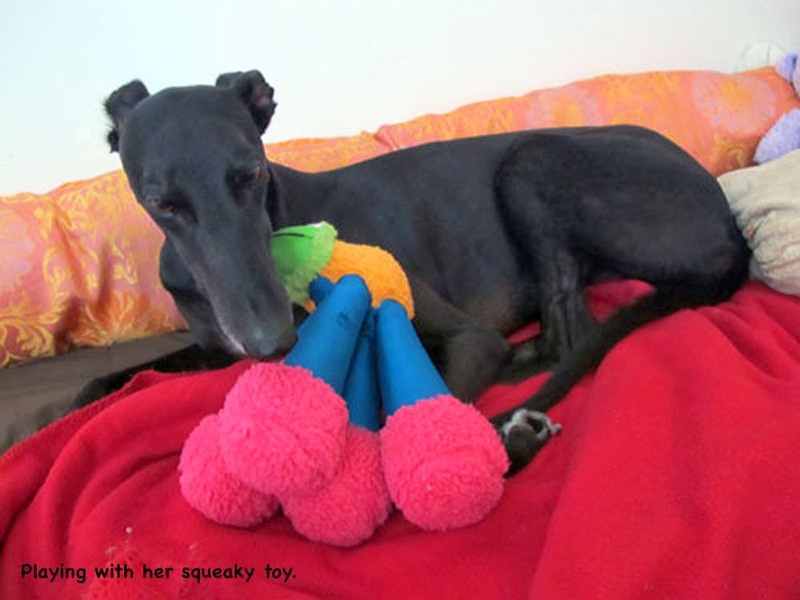 Being a Greyhound, she is of course highly sensitive to sudden sounds and touches, but yet, she recovers very quickly and these sensory impositions do not quell her zeal at all. It is a pure joy that rubs off on me, both sensorially and intellectually. My observations of her lead me to ponder intervention strategies to help myself and others with overwrought senses. Many people have remarked how lucky Lucy is to have found me, but I honestly feel that I am the lucky one to have been adopted by Lucy! The awareness around service dogs is growing, but what do people need to know about them? 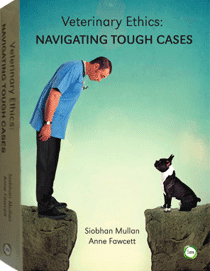 I am not an expert in this area, but dogs have served humans in multifarious ways throughout human history. Dogs can perform specific roles that other humans are unable to. Guide dogs have served the needs of the blind for many years. Nowadays, dogs are fulfilling more functions in our daily lives, apart from being well loved pets. A great number of people suffering from Post Traumatic Stress Disorder find it impossible to relate with other humans, but they find refuge and strength in their relationship with their service dog. Many autistic children who shun human interaction (for myriad reasons) are observed to respond better to animals, especially dogs. The list is a long one, as long as that of existing human anomalies. Of course, it is very important to find the 'right fit,' just like in any close or intimate relationship. If a person with specific needs finds the right companion and is willing to be the best companion in return, the relationship can be extremely rewarding emotionally, offering a great deal of practical support at the same time. Both human and dog grow and learn together, in an enriching and mutually beneficial relationship. We hear that Lucy is the first service dog to be allowed at UNSW. Is this the case and if so, what does this mean? I was told by the people at the Student Equity and Disability Unit that she is the first service dog in UNSW. I am very grateful that everyone has been very open minded and accepting of my unusual requests. 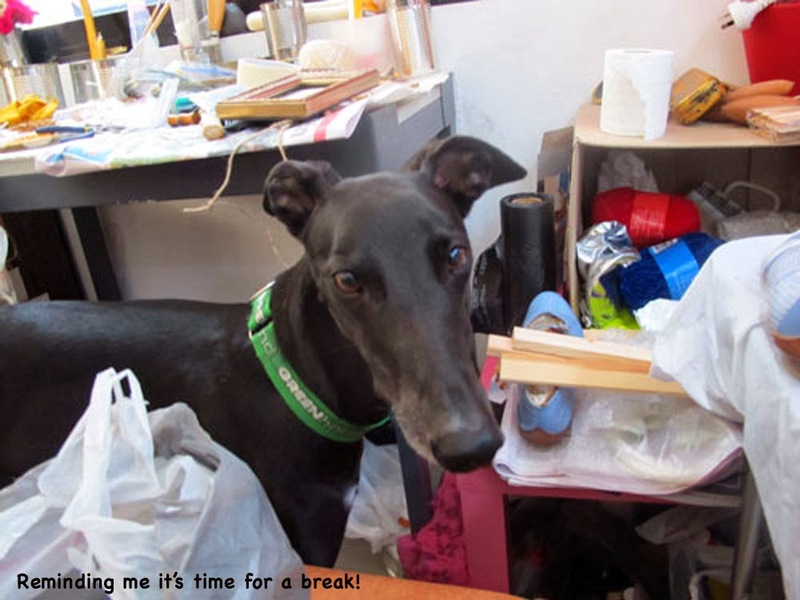 I first sought permission to bring Lucy to my art studio at the College of Fine Arts (COFA) in Paddington, because working for long hours in an unfamiliar environment renders me prone to high anxiety, and Lucy would help me maintain my equilibrium better. The entire application and approval process (letters of support from the university health clinic's doctor, Student Equity and Disability Unit, both my supervisors and final approval from COFA faculty management) was a smooth and pleasant one, and we were made to feel very welcome by everyone, from the faculty, to security personnel and fellow students. Most recently, we moved into accommodations at the main campus, UNSW, in Kensington. My lease on the terrace house I was renting in Paddington had come to an end, and my landlord concurrently informed me of planned redevelopment. Although he was very kind and offered me a month to month arrangement until the redevelopment plans were approved, I nevertheless needed a more stable living environment where I can focus on my work. However, I was unable to secure another affordable rental that would accept Lucy, despite Lucy being my service dog and not just a pet dog. Being on a very tight schedule, I cannot afford the time and energy to fight my case legally, and I don't believe in forcing someone to rent to me if unwilling, so I applied for university accommodation. Again, the process was a smooth one, and I was offered a small studio flat very quickly. This, to me, is an important reflection of how truly inclusive my university is in practice, not merely on paper. As a forerunner of sorts, I also feel a self imposed responsibility to be exemplary in our conduct at all times when on campus grounds. I would love to see more service dogs in campus, and I am honoured to be part of dynamic advocacy in this area. Of course, I am proud of Lucy, that she has been the modicum of good behaviour thus far. You've said before that greyhounds are great assistance dogs for people with autism. Why is this so? 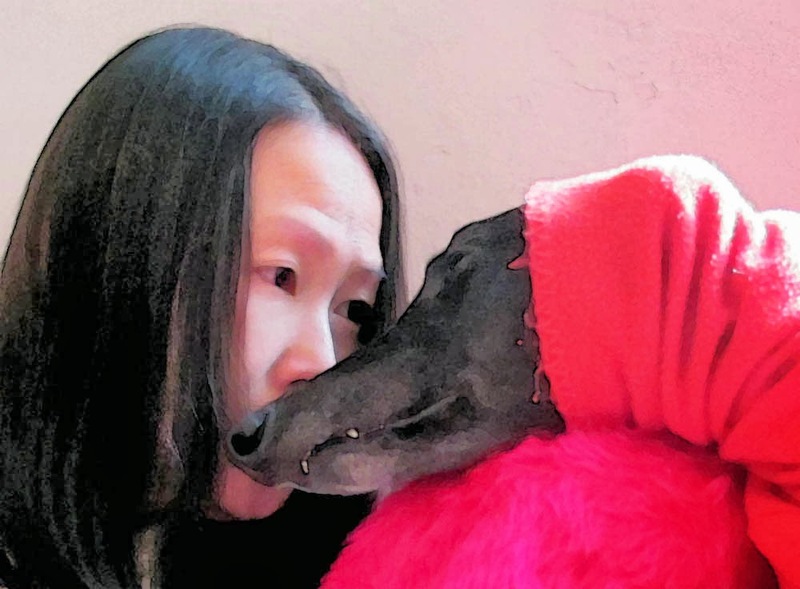 As highlighted above, Greyhounds, because of their more gentle natures, loving and affectionate but not physically intrusive in their displays, are potentially great matches for people with autism, who are averse to loud or sudden sensory disturbances and/or too much physical or spatial intrusions. Greyhounds can be excellent service / therapy dogs for people with conditions that require calmer, gentler and less effusive companionship or interaction. Do you have any tips for veterinarians with regards to working with service dogs? I greatly respect the work that veterinarians do, and vets are usually the first port of call for dog owners who care about their dogs' welfare. Hence, vets are in a key position to help point people in the right direction, even if service dogs may not be their area of specialisation. In my case, I didn't start out intending Lucy to be my service dog, she became my closest and most supportive companion for my daily needs, and I realised that she had taken on the role of service dog without any training at all. My doctor addressed my specific needs, with Lucy in the equation, but it took me a lot of arduous searching to find an organisation with affordable fees and an approach sympathetic to my needs that would train her to be a service dog. It would help greatly if vets are able to suggest reliable training facilities for people interested in their dogs becoming service dogs. Lucy is now enrolled in the "mindDog" programme, and is well on her way towards Australia-wide official certification as my service dog. Thanks Dawn-Joy and Lucy for taking the time to talk to us. And if anyone is interested in supporting mindDOG, please click here.